In April, I found an unexpected message in my email inbox. It was from Iridescent Press, which had been given my name as a potential reviewer for one of its upcoming releases, Travels in Elysium, by William Azuski. This became my introduction to NetGalley, a digital review service where “professional readers” (such as librarians, bloggers, booksellers, educators, and those in the media) can obtain free advance copies of forthcoming books from publishers for review. I could hardly turn down such a request, and so I registered for NetGalley, downloaded the book onto my Kindle, and began reading. It was the chance of a lifetime. A dream job in the southern Aegean. Apprentice to the great archaeologist Marcus Huxley, lifting a golden civilisation from the dead… Yet trading rural England for the scarred volcanic island of Santorini, 22‑year old Nicholas Pedrosa is about to blunder into an ancient mystery that will threaten his liberty, his life, even his most fundamental concepts of reality. Pay close attention to that description as metaphysical mystery. If you’re looking for something like “Indiana Jones and the Lost City of Atlantis,” you won’t find it here. In fact, you may need to keep a dictionary at hand for some of the vocabulary. The linguistic simplification forced by many American presses onto their writers is absent in this work. Comparisons in my mind ran to authors such as Umberto Eco and Gabriel García Márquez, not Ernest Hemingway. This is not a novel for the casual reader. Like Eco and García Márquez, Azuski conjures a remarkable sense of an exotic place. The reader is immersed in the sights, sounds, smells, tastes, and feel of Santorini under the military junta of the early 1970s and in the mystical reality that intersects with the mundane world. Main character and narrator, Nicholas Pedrosa, immediately finds himself caught up with people and events he doesn’t begin to understand. What happened to his predecessor? What is archaeologist Marcus Huxley really searching for? What is Atlantis? For that matter, what is reality? Azuski combines aspects of mystery, philosophy, history, archaeology, and mythology in weaving the story. Nicholas Pedrosa spends much of the book searching for meaning and sense around him, and I often had a similar feeling of being “at sea” while reading the story. Some readers may take this as a weakness in the writing, but I suspect Azuski wanted exactly such a reaction from his audience. We are with “Nico” on his journey. We are meant to question not only what we read and what it means, but also our own preconceptions and ideas. This is an original take on the Atlantis myth, and Azuski’s writing style complements the complexity of the various story lines. Descriptive passages at times match the pace of life in a place not fully in the modern world. But when that modern world intrudes, the writing shifts to meet it. His characters are complex and offer insights into the mysteries and ancient puzzles that surround them as they delve into a lost city—and into their own thoughts and beliefs. Travels in Elysium is now available in bookstores and with online retailers in both paper and electronic formats. 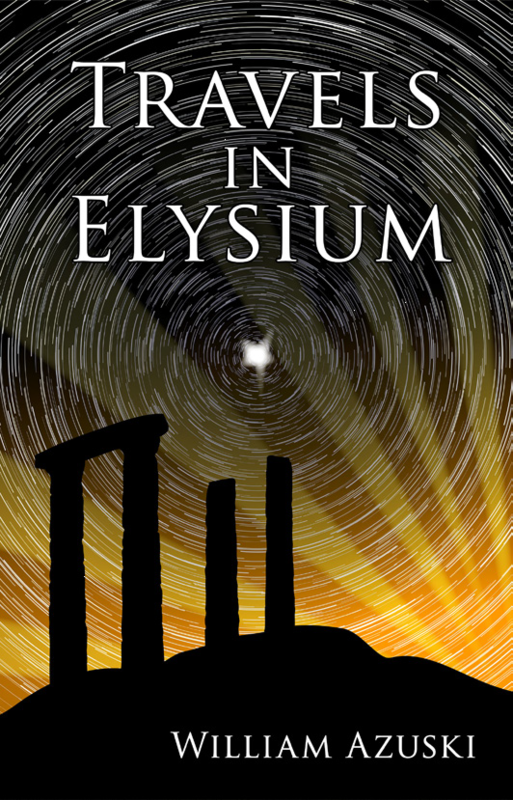 This entry was posted in Archaeology, blogging, book reviews, writing and tagged archaeology, Atlantis, book review, fiction, Iridescent Press, NetGalley, novel, Travels in Elysium, William Azuski, writers, writing. Bookmark the permalink. You have me intrigued! A great, honest review. Well done! Thanks, Gemma! I suspect this reads more like a review of an academic work than of a novel. For me, the rating systems such as you see on Amazon aren’t very helpful. Readers have such different tastes, and there’s also no standardization for the rankings. One reader’s “3 Stars” might be a 5 for another. So I thought I’d stick more to an objective review and focus on what type of book this is and the type of reader who might enjoy it. I’m glad it’s working as I hoped! Thanks for the thoughtful review—-my summer reading is typically light and airy so will probably not try to tackle this :-). I enjoy light and airy, too. 😉 And I can devour books like that in no time. This took several weeks of evening reading and required a slower pace and more active thought about the words on the page. As 4amWriter says below, it helps to be in a frame of mind for that kind of read. I thought it was important to let everyone know that this book is not a fantasy adventure! I liked that bit about the decline of language, as well. I struggle with it in my own writing, of course, because every person and their auntie seems to tell me to keep it simple…but it’s nice to know there are authors out there unafraid to tell a more complex story, with complex words. Simple certainly has its place, but thoughtful should, as well. I can’t stand spoilers, so you won’t see me giving away any plot points in a review! And because tastes are so subjective and individual, it’s hard to know whether another reader’s review would be similar to mine. So I want to focus on more objective points and let readers decide if a book is worth checking out based on those. I like simple and fast-paced books, but I also enjoy those that are more complex and require the reader to think critically. The big presses may shy away from the latter these days, but I’m glad to see that some of the smaller houses are willing to take them on. “Trust no one. Believe no one. Question everything. Remember, there is nothing here you can take at face value… No —not even yourself.” My first Sociology prof said pretty much the same thing. I lived by that rule and drove my profs nuts until I received my degree and now it is so ingrained I have become a complete and utter cynic. And I always have my dictionary on my desk. I think I’d like to read Travels in Elysium and I see it can be had for Kindle.at Amazon.com. Thank you! I found it a very interesting read. And I wanted readers of this post to know what to expect. It would be so easy to think a book “about Atlantis” would be an adventure story along the lines of an Indiana Jones movie. And a reader looking for that would likely be disappointed. I’d be curious to know what you think if you read it! This sounds like my kind of book! I love literary fiction and I’m always a little disappointed when the writing style is too simplistic (maybe one reason I can’t find an agent)! 🙂 I also love philosophy and history and delving into the mystical so I’ll have to check this one out. Great review – you’ve got me intrigued! Sounds like this isn’t the kind of book I can read in the park while kids are playing around me! I love literary fiction, but I definitely have to be reading it in the right environment–with no interruptions and without being rushed–to truly enjoy the work. No, distractions will not do when reading this book! It took me several weeks of evening reading to get through it. One, it is long. According to Amazon, the paperback is 540 pages. But two, it’s literary fiction. And there’s no speeding through such writing. I’m glad you liked the review. As I mentioned to Gemma above, it’s more along the lines of a review of an academic work than an Amazon review. What one reader loves, another can’t stand. And what one reader considers “3 Stars,” another might give 5. So I’d rather focus on what the reader will encounter over my personal likes and dislikes about aspects of the story and characters. That’s so cool that you’re a “professional reviewer.” Sounds like this was a novel read (no pun intended, but unlike most times, I actually mean it). I sometimes like a book with challenging vocabulary. Salman Rushdie and (particularly) William Falukner have me running to the dictionary all the time. And after that last flick, I don’t think people want to see Indiana Jones and the anything any more. Yeah, that last one wasn’t worth the price of admission. I’d heard Russian Communists were really insulted, but frankly, all Russians should have been. The stereotypes in the movie made me cringe. (Maybe because of my Slavic roots.) Oh, and by the way Spielberg and Lucas—there’s no way Indy survives the bomb test at the beginning of the film. No way. He’s toast—a radiated sack full of broken bones. End.of.story. Now and again I enjoy sinking my teeth into a good piece of literary fiction. But I also enjoy lighter fare like cozy mysteries and sci-fi that isn’t overly dystopian or tech-heavy. This took me longer to read than those, but I enjoyed it. When I have more time, I want to look into requesting available books from NetGalley. Glad you added comments about the book blurb – the actual book might disappoint readers looking for beach/air travel/easy to stop and start reading. Sometimes we can misinterpret a book’s cover and blurb. And I didn’t want anyone thinking this was an easy summer romp through a sci-fi or fantasy story. I enjoy those, too, but now and again I like a meatier book that makes me slow down and think about what I’m reading. Rating systems based on subjective criteria (like Amazon’s) aren’t very helpful for me. Are the reviewer’s criteria for “3 Stars” the same as mine? Probably not. I also wouldn’t leave a 5-Star review because I think the highest ratings should be for books that have stood the test of time. So I rarely leave reviews on Amazon, except in a few special cases for some blog buddies. Now that I’m signed up for NetGalley, I want to start requesting some titles next month when I have more time. I think it’s a really good idea for helping to promote books. I like the sound of this book. I enjoy Umberto Eco, so I found your comparison to other authors helpful to get an idea of what to expect. Comparisons can be hard to make. And not everyone has read the same books, so they may or may not be helpful to someone reading the review. At least they’re a starting place, though. And I think I’ll do more book reviews on the blog as a way to keep things fresh.